Security services feared Munir Mohammed and Rowaida el-Hassan were ready to strike before they were detained in December 2016, with police saying a “significant loss of life” had been averted. He had also downloaded manuals on how to make mobile phone detonators and ricin, a deadly poison that can kill an adult victim with just a few grains. 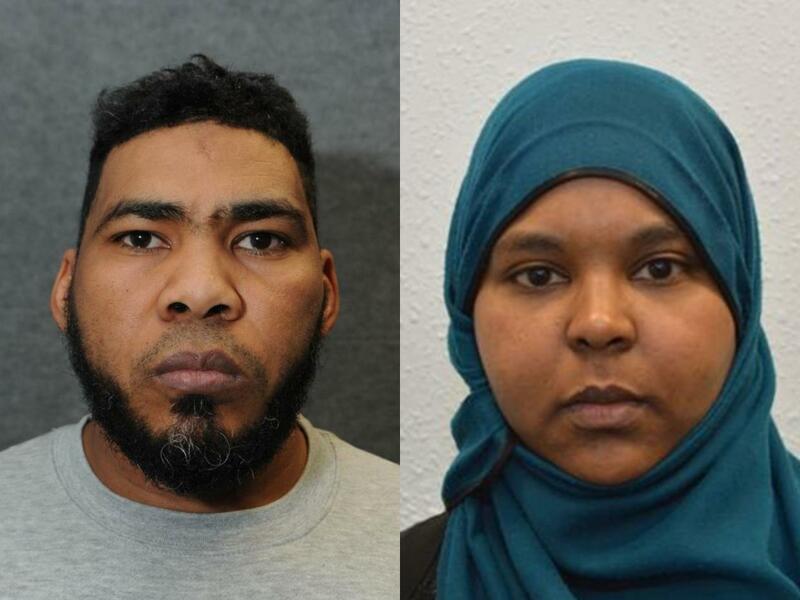 Mohammed, of Leopold Street in Derby, and El-Hassan, of Willesden Lane in north-west London, denied preparing terrorist acts between November 2015 and December 2016 but a jury found them both guilty…. The Old Bailey heard that El-Hassan, a pharmacist, became a willing participant in the plot after meeting Mohammed on dating website SingleMuslim.com. Jurors were told the pair had a “rapidly formed emotional attachment and a shared ideology” and were in regular contact on WhatsApp by spring 2016, meeting in a London park near El-Hassan’s home. Records of their messages show they shared extremist views and videos, while Mohammed was put in touch with a man he believed was an Isis commander via Facebook. Prosecutor Anne Whyte QC said Mohammed “resolved upon a lone wolf attack”, while working making sauces for supermarket ready meals, and El-Hassan was well aware of his plan. He pledged allegiance to the man, known as Abubakr Kurdi, and offered to participate in “a new job in the UK” – a phrase jurors were told referred to a terror attack. El-Hassan, a 33-year-old divorcee with two children, advised Mohammed on what chemicals to buy for a bomb, the court heard. He also looked at pressure cookers at Ace Discounts, which the prosecution said could be used to contain the explosives, according to several terrorist manuals. Police found hydrogen peroxide in a wardrobe and hydrochloric acid in the freezer of his home during a raid on 12 December 2016 but Mohammed claimed they were for domestic purposes. But Mohammed had an arranged marriage in Sudan with a woman he had never met called Fatima, who he was hoping to bring to England on a student visa. He had arrived in Britain in the back of a lorry and claimed asylum in February 2014, the court heard. After awaiting a decision for more than two years, he appealed to his local MP Margaret Beckett for help, but she was told his case had been referred to a “specialist unit for consideration”. Asked if she had feelings for Mohammed, she said: ”It was mixed feelings at the time. Yes, there was emotional attachment. Police said it could not be proven that El-Hassan was an extremist before she met Mohammed, but could have been in no doubt about his jihadi beliefs. Detective Chief Inspector Paul Greenwood, who led the investigation, said the website they used was a “normal place to look for a relationship”. But Mohammed used it to get advice on where to source chemicals to manufacture TATP from El-Hassan, who was previously unknown to the security services. “Munir shared with her some really graphic and brutal execution videos, lots of other ideological material, including children executing Isis prisoners and children involved in military training in the name of the Islamic State,” DCI Greenwood said….